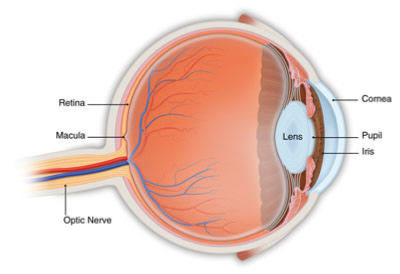 The retina is a layer of light-sensing cells lining the back of your eye. As light rays enter your eye, the retina converts the rays into signals, which are sent through the optic nerve to your brain where they are recognized as images. The macula is a small area in the center of the retina that allows you to see fine details clearly. Due to aging, trauma or other eye conditions (such as myopia), a hole in the macula (macular hole) can form or the retina can be torn or pulled away from its normal position. A detached retina is a very serious problem that can cause severe vision loss unless it is treated. Repair of a detached retina or macular hole may require face-down recovery. No. Macular holes and age-related macular degeneration are two separate and distinct conditions, although the symptoms for each other are similar. Both conditions are common in people 60 years and over. An eye care professional will know the difference. Most of the eye's interior is filled with vitreous, a gel-like substance that fills about 80 percent of the eye and helps it maintain a round shape. 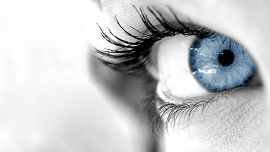 The vitreous contains millions of fine fibers that are attached to the surface of the retina. As we age, the vitreous slowly shrinks and pulls away from the retinal surface. Natural fluids fill the area where the vitreous has contracted. This is normal. In most cases, there are no adverse effects. Some patients may experience a small increase in floaters, which are little "cobwebs" or specks that seem to float about in your field of vision. However, if the vitreous is firmly attached to the retina when it pulls away, it can tear the retina and create a macular hole. Also, once the vitreous has pulled away from the surface of the retina, some of the fibers can remain on the retinal surface and contract. This increases tension on the retina and can lead to a macular hole. In either case, the fluid that has replaced the shrunken vitreous can seep through the hole in the macula, blurring and distorting central vision. Macular holes can also occur from eye disorders, such as high myopia (nearsightedness), macular pucker, and retinal detachment; eye disease such as diabetic retinopathy and Best's disease, and injury to the eye. Macular holes often begin gradually. In the early stage of a macular hole, people may notice a slight distortion, or blurriness in their straight-ahead vision. Straight lines, or objects can begin to look bent or wavy. Reading and performing other routine tasks with the affected eye become difficult. How is a detached retina or macular hole repaired? To repair the damaged retina, your ophthalmologist (Eye M.D.) removes some of your eye's vitreous (the gel-like substance that fills the inside of your eye) and injects a gas bubble into your eye to take its place. This bubble holds the retina in place as it re-attaches to the back of your eye. You may have to keep your head face down (parallel to the ground or to the side) for up to several weeks after surgery so the bubble will be in the right position. With time, the bubble disappears and is replaced with your normal eye fluid. Your ophthalmologist will tell you how long you must maintain face down positioning of your head and eye. Why is maintaining a face down position so important? Once inside your eye, the bubble will rise to the top and float there (see figure 1). 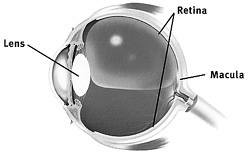 Since the retina lines the back of the eye, your head must be face down (or to a specific side, depending on your condition) so the bubble floats and holds the retina in place correctly (see figure 2). Figure 1. When standing or sitting upright, the gas bubble will float incorrectly in your eye. Your retina may not heal successfully in this position. Figure 2. Correct Position. When seated or lying face down, the bubble will float in the correct position in your eye, putting pressure on the retina and helping it reattach to the back of the eye. Your surgery may not work unless you maintain the correct position. Lying in the wrong position, such as face up, puts pressure on the other areas in the eye and may cause the development of further problems, such as a cataract or glaucoma. Must I maintain a face-down position at all times - even when walking? Yes; unless your ophthalmologist instructs otherwise, you must maintain the face-down position at all times. This includes when you are standing, eating, walking, sitting or lying in bed. When walking, you should have someone walk with you to avoid injury. The face-down chairs, cradles and pillows support your head or body so that you can read, write, sleep and eat more easily and comfortably during the face down recovery period. The face-down mirror allows you to see people and objects around you without having to turn them upside down. You can still watch television and have face to face conversations with visitors. What if I cannot remain in a face-down position after surgery? If you cannot remain in a face-down position for the required period after surgery, vision recovery may not be successful. People who are unable to remain in this face down position for this length of time, may not be good candidates for vitrectomy surgery. However, there are a number of devices that can make the "face-down" recovery period easier on you. There are also some approaches that can decrease the amount of "face-down" time. Discuss these with your doctor.